Pixar's done it again! The studio just keeps churning out gem after gem of a film. Bravo to director Pete Docter, co-director/writer Bob Peterson (who also voiced the hilarious Dug the dog), and the amazing animators for breaking my heart then mending it yet again with a wondrous visual feast. Pixar's strength has always been its story-telling. And the touching and eye-popping UP is no exception. 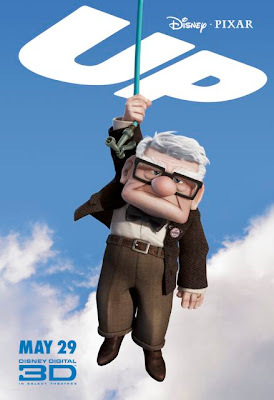 I've been waiting to see UP from the first time I saw its trailer. I can see myself in the curmudgeonly Carl Fredricksen (voiced by Ed Asner). I don't want to give too much of the plot away, but we all know Carl goes on a South American adventure by tying balloons to his house. He is joined in his fanciful journey by Wilderness Explorer Russell (Jordan Nagai), who only wants to earn his badge for assisting the elderly. (The pairing is highly unusual: a 78 year old man with an Asian boy sidekick. Kudos Disney/Pixar!) Christopher Plummer is the voice of explorer Christopher Muntz, Carl's childhood hero. The film is filled with astonishing images, splashes of color, gorgeous palettes and life-like textures. The love story of Carl and his wife Ellie is told in a silent, exquisite montage. It is animation and filmmaking at its best. A true work of art, but at its center lies a fun yet extremely wise fable about love, loss, letting go, following your dreams, and the adventure we call life. The film is rated PG because of its grown-up themes. In fact, when I saw it yesterday, most of the audience members were adults. But kids will have a blast, too. (The pack of dogs could have their own spin-off movie.) And don't miss the charming short animated feature Partly Cloudy that precedes the film. Two thumbs UP...WAY UP for UP!